Tracking the success of your online marketing activity is invaluable. 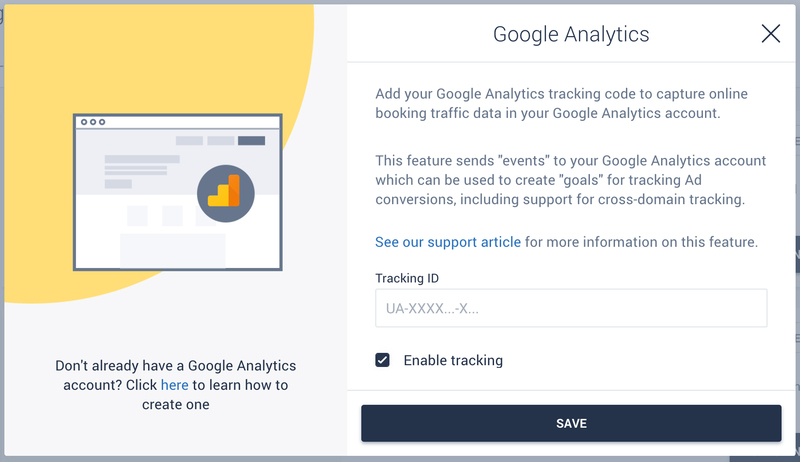 We've built helpful features necessary to track online ad conversions, using goals and events in Google Analytics. Setting up Google Analytics is a breeze. If you already have an account, click here to find your tracking code. If you do not have a Google Analytics account yet, click here to create one. NOTE: If you do not see these options in your account, request your upgrade to Fresha at info@shedul.com. Once you have an ID, paste it under Online Bookings > Analytics > Setup Now. Ensure Enable Tracking is ticked and click Save. Each Shedul account can be integrated with only one Google Analytics ID. You can also use Google Analytics to track conversations from Adwords by connecting the two. If your AdWords campaign is linked to your own website (which uses your Fresha Book Now link) you can track conversions from your Fresha online booking, as long as your cross-domain tracking is configured correctly. IMPORTANT: If the Tracking ID's do not match, the conversions will not track. Make sure the Tracking ID (e.g. UA-XXXXXX-X) from your Google Analytics script, and implemented in your website, is the same one added to your Shedul account under Analytics. Are you receiving events after booking an appointment? Events will only be sent to Google Analytics for new appointments scheduled from your Fresha online booking link after the integration was set up. If you are seeing events being sent to Google Analytics, that means the integration is successful. Double check the date range selected inside of Google Analytics. By default it will exclude today. Are there no goal conversions? If you see events from Fresha but they aren't showing up as goals, this will most likely be due to a goal having a typo, so it's worth doubling checking there are no mistakes. NOTE: Goal conditions are case sensitive and must match the Category, Action, and the optional Label (if it is entered) exactly. You can click verify this goal to test the goal settings. 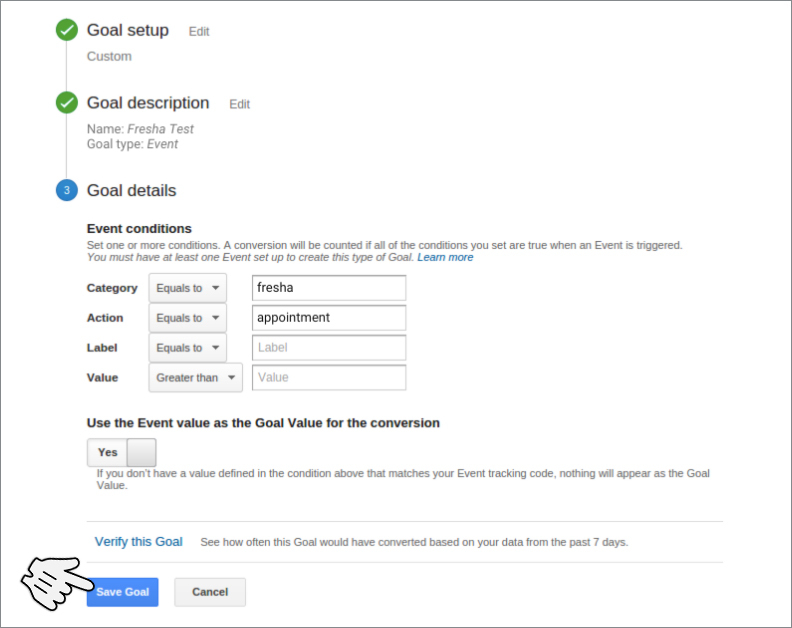 If the goal conditions exactly match what's in Fresha, you should follow along with the next section to be sure you can see events from Fresha in Google Analytics. Are referrals for goals showing your own domain? You'll need to add your domain to the referral exclusion list in Google Analytics so that it doesn't show your domain referring traffic to your Fresha online booking. Once you ignore referrals from your own domain, the original traffic source will be preserved.